In today’s costly world, homeowners are fully aware of the expenses related to inflated energy costs and inefficient home security systems. There is nothing worse than receiving an electricity bill and being shocked by the amount owed at the end of a month or stolen possessions that could have been more strategically secured. Such realities have led homeowners to seek technologies that can help them beat the current system. A growing number of homeowners are educating themselves on basic energy management and security devices, which often combine the use of innovate shade and control systems. For instance, Control4 offers a number of solutions that help homeowners monitor and control their home lighting from an iPad, iPhone, or wireless remote. With Control4, you can pre-program lighting levels and reduce energy output. 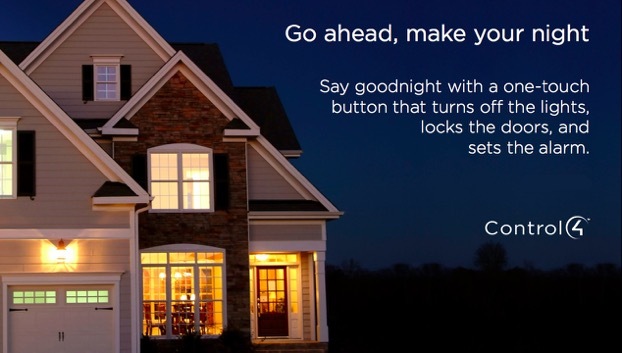 It is also amazingly easy to set lighting to turn on and off at specific times. This significantly reduces the possibility of a light being left on throughout the night, or for several days while a homeowner is on vacation. Additionally, with Control4’s remote access service, no matter where in the world a homeowner travels he or she can turn lights on or off with a simple touchscreen command. To make the management of lighting much easier to maintain, Control4 offers keypads with captions that can read “kitchen”, “hallway”, “master bedroom”, “patio”, and more. With a push of a single button, lighting is ignited in a desired location. The Control4 suite of products also offers dimmers that allow for lights to be set to a particular level. Another ground breaking product for ultimate lighting, shading, security, and energy control is the Lutron RadioRA 2. The system is a holistic approach that combines total light and shade functionality. Radio RA 2 has the power to adjust the amount of daylight and electric light in a room throughout an entire home. Shades can also be lowered, electric powered curtains closed, and lighting ignited at pre-programed times. For instance, if particular rooms within a home are in direct sunlight in the afternoon, the lowering of window shades and closing of curtains can significantly reduce room temperatures. Or when the family is on vacation and dusk approaches, lowered shades, closed curtains, and automated lighting can offer higher levels of security. And for the family that has developed a high-tech home theatre, with the single push of a button window shades can be lowered and lights set to a particular level to create the perfect ambiance. Seeking to automate your home for added simplicity, comfort, energy efficiency, and security? The beauty of 2012 is that homeowners have more control than ever before! The secret to discovering and installing a solution that best fits your needs is to consult with a personalized home automation expert. At Digital Smart Homes of Vancouver BC, we would be honored to provide you a free consultation. Give us a call to set up an appointment at 604-375-3474 or visit our innovative showroom at 1385 West 6th Street Avenue in Vancouver. We live to automate, simplify, and secure your world!